The MDC-Alliance and its leader Nelson Chamisa are still alleging the presidential election results were ‘fake’ and planning legal action. Emmerson Mnangagwa, Zimbabwe’s president-elect and leader of the ruling Zanu-PF, who won the tightly contested July 30 presidential election, will be sworn into office on August 12 in Harare. The country’s foreign affairs ministry this afternoon dispatched an invite to foreign envoys and international organisations accredited to Zimbabwe. “The ministry of foreign affairs and international trade presents to all heads of diplomatic missions, international organisations and honourary consulates accredited to the Republic of Zimbabwe and has the honour to invite the latter to the inauguration of the President-elect of the Republic of Zimbabwe, His Excellency, Emmerson Dambudzo Mnangagwa, which is scheduled for Sunday August 12, at the National Sports Stadium,” the circular released by the ministry reads. Zanu-PF United Kingdom branch chairperson, Nick Mangwana said the inauguration of Mnangagwa meant the start of real work. “It’s happening on the 12th of August 2018 at 10:30am at the National Sports Stadium. From next week, Zimbabwe will be a hub of progress, never the same again,” he said. 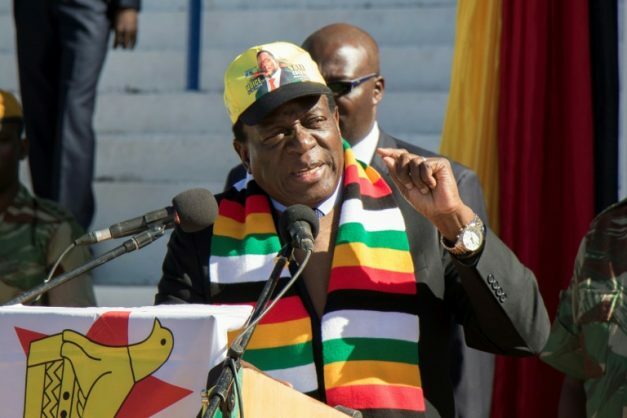 Mnangagwa’s inauguration date is being set at a time the opposition MDC-Alliance and its leader Nelson Chamisa are still alleging the presidential election results were “fake” and demanding that the electoral management body, Zimbabwe Electoral Commission (ZEC), releases genuine numbers. ZEC announced last Friday that Mnangagwa had won by 50,8% of the 4,8 million votes cast to thinly avoid a re-run, while Chamisa garnered 44,3%. Chamisa, who has been making noise on social media, announced on Monday afternoon that he has assembled a legal team to challenge the results. The opposition has until Friday to challenge the results proclaimed by the electoral commission, according to law. The opposition leader shared on the micro-blogging site Twitter that evidence to challenge Mnangagwa’s declaration as the president was now ready. “I’ve just finished going through the evidence per our agents and V11 forms from across Zimbabwe. We won this election emphatically. ZEC’s figures are falsified and inflated in favour of the outgoing President. We are ready for the inauguration and formation of the next government #Godisinit,” he said.